The fair season is now in full swing with the biggest map fair in Europe being held at the Royal Geographical Society this weekend. The London Map Fair brings together the world's leading dealers in antiquarian maps and boasts stock priced to suit all budgets (from £10 to £100,000). Free to attend, the fair is a great opportunity for any seasoned or budding map enthusiast to meet with the foremost experts in the trade and brush up on their cartographic knowledge. Ashley Baynton-Williams will be giving talks on map collecting for beginners throughout the weekend and Frank Jacobs will also be giving a lecture this Saturday at 2:30pm entitled "The Future of Map Collecting in the Digital Age". Please click here for more details. Although we will not be exhibiting at the fair, Sotheran's is always looking for new and interesting additions to our antique map collection. Perhaps our most exciting acquisition of late is William Harvey's Geographical Fun (pictured above). 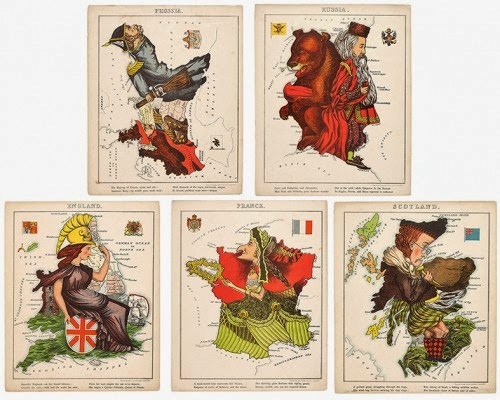 The atlas consists of twelve maps of European countries, each with a unique national stereotype created by the author based on the outline and shape of the country. Each image is accompanied by a short verse describing the authors creation. Written under the under the pseudonym 'Aleph' the author described his intention in creating the atlas in his introduction: "It is believed that illustrations of Geography may be rendered educational, and prove of service to young Scholars who commonly think Globes and Maps but wearisome aids to knowledge. If these geographical puzzles excite the mirth of children, the amusement of the moment may lead to the profitable curiosity of youthful students and embue the mind with a healthful taste for foreign lands." The resulting fanciful caricatures include England in the form of Queen Victoria; Scotland as a gallant Piper struggling through the bogs; Wales in the form of Owen Glendowr; Ireland as a Peasant, happy in her baby's smile; France as an Empress of cooks, fashions, and the dance; Spain and Portugal joined in lasting amity; Italy as a revolutionary figure complete with liberty cap; Prussia in the personages of Friedrich Wilhelm and Prime Minister Bismarck; Holland and Belgium as female figures who represent a land . . . and perfect art made grand; Denmark as a female figure with ice skates; and Russia as the classic bear. This atlas is hard to find complete as the individual maps are often split and sold individually. As the maps and text had become detached from the binding we have had the twelve maps uniformly mounted and presented in a custom-made box, preserving the original binding and text leaves within. More maps here and on Pinterest.